How relaxed should royal portraits be? We got two new official royal portraits last week and both gave us a different take on this regal staple in the 21st century. Denmark's official pictures of Crown Prince Frederik and Crown Princess Mary were close to the usual with the two in full formal attire in images released to mark the future king's role in his country's Armed Forces. 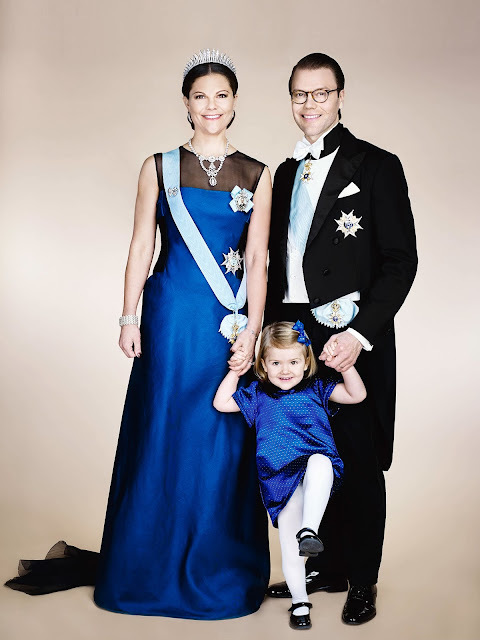 Sweden gave us a new photo of Crown Princess Victoria, Prince Daniel and Princess Estelle and while the beginnings of that were everything we'd expect, there was a high kick from a second in line to the throne which turned it from formal to family. But how relaxed should royal portraits be? The royals are really getting back in the swing of things after the summer with plenty of engagements and almost as many appearances on social media. We've had hard hats, hard stories and hard luck this week...here are the royals on social media. 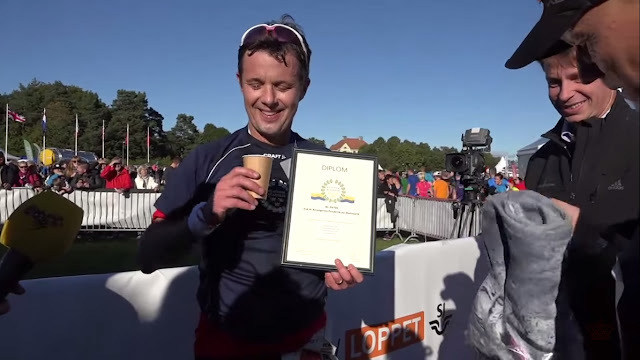 As the summer came to an end there was lots of sport on the royal agenda with Crown Prince Frederik of Denmark getting sweaty as he completed the Swedish Super Classic at the Lidingo Race. A video was shared on the official Danish Royal Family You Tube channel featuring a faintly out of breath future king talking about his sporting dreams - the full video can be seen here. 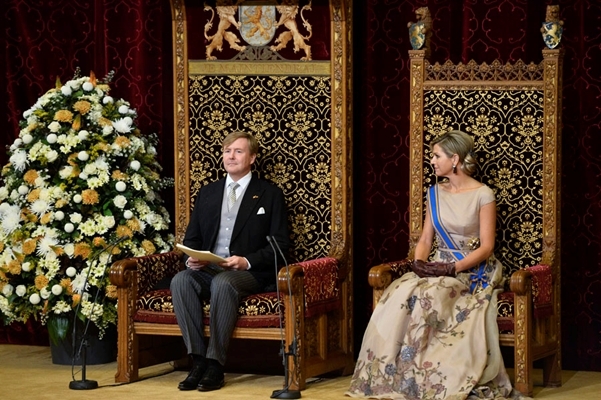 It only took a couple of years for Queen Maxima of the Netherlands to gather enough confidence to totally steal the show at the opening of her country's parliament. In 2015, her third appearance on Prinsjesdag as a queen consort, saw her score a huge fashion win that knocked just about everyone sideways and left all eyes on her. The Japanese print dress was totally unexpected and a total winner. It was the most subtle and successful of the three outfits she's worn for this big event - the colour was more muted, the accessories less dramatic and the result was a huge fashion win. 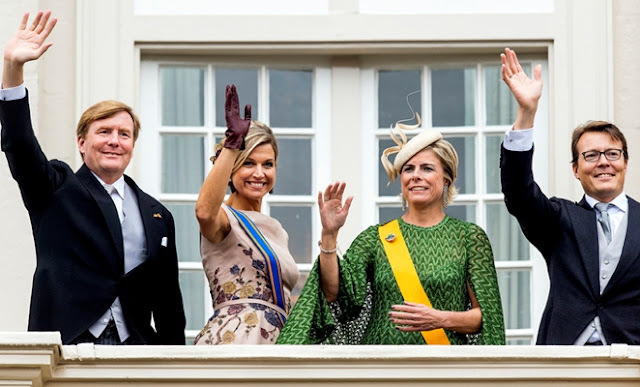 Perhaps the biggest surprise of this third Prinsjesdag outfit was the absence of a hat. Maxima does love a huge hat and 2013 and 2014 had seen her stick to her style and add massive toppers to the outfits. 2015 was all about a chic updo and the frock. The Duchess of Cambridge was back in action on her first solo engagement since the birth of Princess Charlotte in May. Kate headed to the Anna Freud Centre in London to hear about their work helping young people with mental health problems. 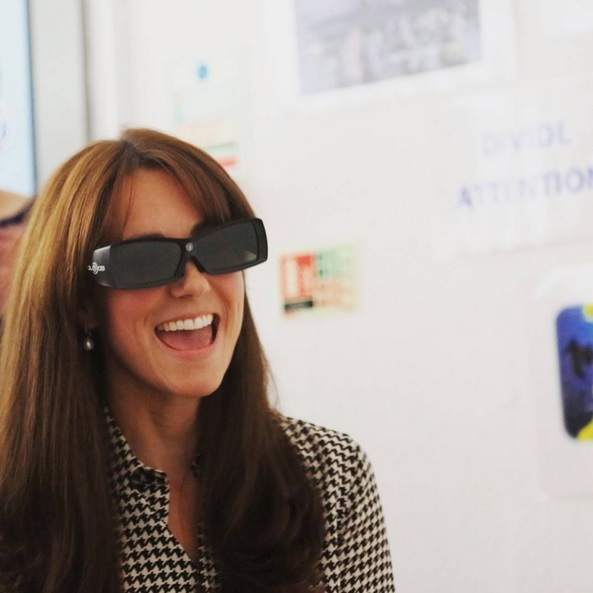 She donned a dogtooth dress and added a pair of huge dark glasses while trying out the Neuro Tracker game which helps build emotional resilience - the moment was captured on the Kensington Royal official Instagram account. Most striking outfit of the visit was the silver flapper style dress donned for a visit to Miami-Dade College where her husband received the Presidential Medal. It started off underneath a slate grey evening coat then made an appearance all by itself where its full thirties styling could be appreciated. No doubt about it, the Queen of the Netherlands looked sensational as she attended Prinsjesdag for the third time as consort of her country. Her full length gown this time was unusual and a winner. In palest beige with a beautiful Japanese style print of birds and flowers along the lower part of the flowing skirt it was fresh, elegant and classy while giving everyone a lesson in how to do formal with a modern twist. Dare we say it but it was a bit of a let down. 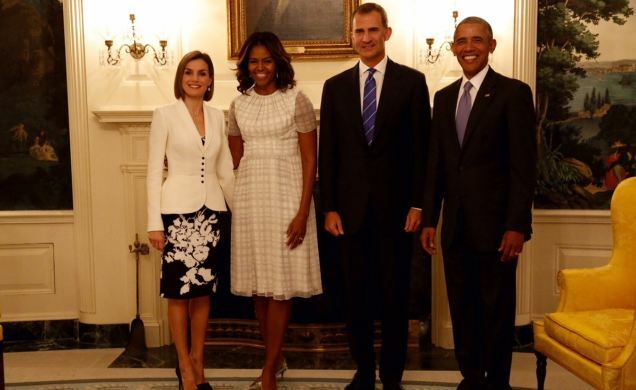 The Queen of Spain went to America on a much heralded visit which included a stop in the White House and all eyes were on the fashion choices of Letizia. But they were rather sedate and very much in black and white. For her visit to the home of the US President, Letizia picked a black dress with white flower print teamed with a white jacket with five neat buttons running down the centre. It was chic, appropriate and rather uninspiring. And it was wiped off the page by Michelle Obama's take on relaxed formal - her beige and white print dress was a stunner. The queen got the chance to show off the dress in all its glory when she took a walk around the grounds with Michelle Obama. There are lots of things to do on a grey Wednesday afternoon but not many of us have the option of writing our names in the history books for all time. But as the clock ticked round to 5.30pm on Wednesday September 9th 2015, Elizabeth II did just that. 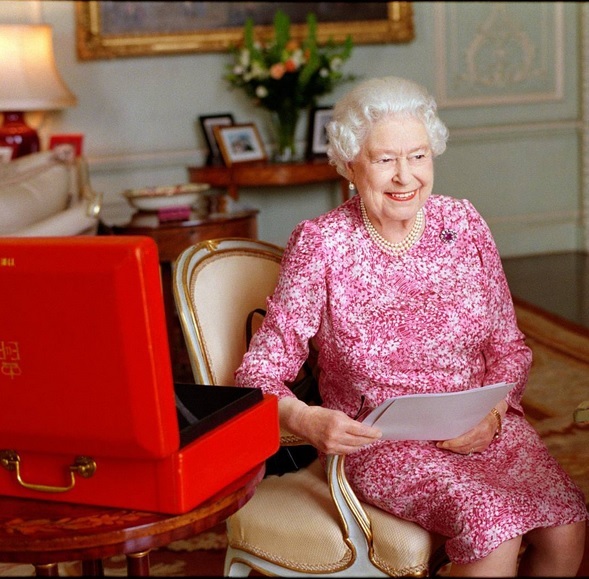 She is now the longest reigning monarch in British history. The age of Victoria is over, this is truly the era of the second Elizabeth. She is said to have wanted things to be 'business as usual' but this was an extraordinary day. 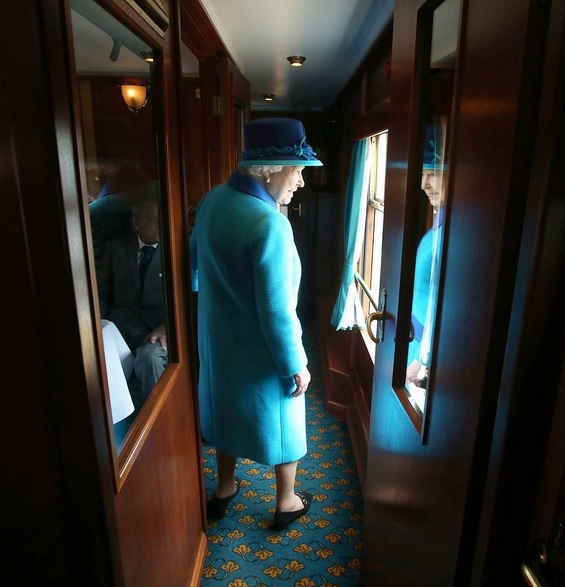 And as the Queen travelled on a train in Scotland even Elizabeth II realised that her wish couldn't come true. The business was to open a new railway line in Scotland but the as usual disappeared,. Crowds turned out everywhere to see the woman who was about to carve her name in the history books as Britain's longest reigning monarch. The day began at Edinburgh Waverley Station where there were lines and lines of people waiting to see the historic queen. She travelled on to Newtongrange and Tweedbank where she made a short speech thanking people for their kindess on her milestone.